Are "old economy" corporations embarking on a jihad against their own overweight or chronically ill employees just to save a few dollars in insurance? Incredibly, the evidence seems to suggest they are. The president of the Business Roundtable (BRT), John Engler, is having a private sit-down Tuesday 12/2, at which the BRT may threaten to "switch sides" in the ongoing Affordable Care Act (ACA) debate. All this fuss is over a part of Obamacare that disproportionately grates on CEOs: not the expense of covering children until they are 26, not the arbitrary 30-hour cutoff point for "full-time work," not even the requirement of providing insurance at all. No, this fuss is over: workplace wellness programs. For the uninitiated, those are programs - that perhaps 90 million Americans are subject to - in which human resources (HR) executives "play doctor," by hiring vendors to ask employees intrusive questions, poke them with needles, send them for checkups, and browbeat them into attempting to lose weight. The impetus for Tuesday's meeting is that the BRT is upset because recently the Equal Employment Opportunity Commission (EEOC) has been filing suits against companies, most recently Honeywell, that allegedly give employees (and sometimes their spouses) an ultimatum: submit to our medical tests or pay fines up to $4000. Mandatory medical examinations violate the Americans with Disabilities Act, which the EEOC enforces. Needless to say these wellness programs are highly unpopular, so unpopular that companies have had to triple the financial incentives and penalties since 2008 to a whopping $594, just to keep participation rates from falling. At two organizations, Penn State and CVS, employees have revolted against their programs. But all that fuss by the BRT, all those unpopular programs, and all this spending are justified because the rest of us are subsidizing overweight and chronically ill employees, right? Wellness programs will save all of us money by making these people better off, right? Second, and more importantly, wellness can be hazardous to your health. Workplace wellness programs generally require far more screening than accepted guidelines recommend. Overscreening generates "false positives," leading to expensive, uncomfortable, unnecessary and possibly hazardous treatment for conditions that don't exist. HR departments often require routine checkups even though routine checkups for asymptomatic adults are not recommended by the Journal of the American Medical Association itself. And fines or rewards for losing weight incentivize binging prior to the first weigh-in and crash-dieting prior to the subsequent ones, activities that are far more hazardous than simply being overweight. Let's examine each. 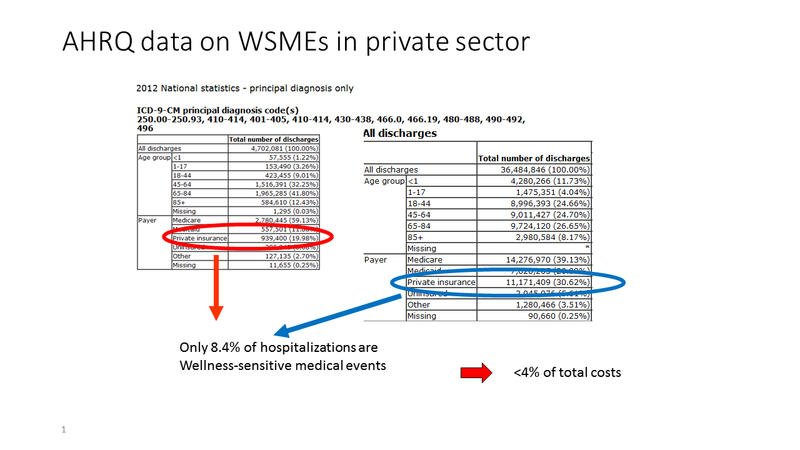 As to the first, these people didn't get to the C-Suite by simply accepting information that their vendors tell them, especially when it's quite easy for their accountants to tally up their company's heart attacks and related events (since self-insured companies pay separately for each hospitalization) to see how rarely these "wellness-sensitive" events occur. And they also must know that, as with the tobacco industry years ago, an industry fails the sniff test when its only defenders are people who profit from it. Both explanations make no business sense, though the second at least passes the harsh test of Scroogian economics. Even so, there must be some reason why large corporations have chosen to fight this particular ACA battle, other than to preserve the right to harm their own employees and bank accounts.